My experience of Linocut printing from school was of very hard flat brown squares and blunt chisel like knives all in too little time to plan what we wanted to do. My main feeling about it was frustration and the result of the quick experience was an odd abstact design of part of a sketch of palm leaves. Definately nothing to brag about. Has everybody tried this at school? Was anyone successful in doing it? Please tell me in the comments. I saw a workshop advertised at ARTPAD in my town and I thought it would be good to have a go and that it must be nicer to do than it was at school. I hoped that there had been developments in that horrible brittle tile. So, will my experience be frustrating, unpleasant and physically hard work? Ok, that sounds basic enough. 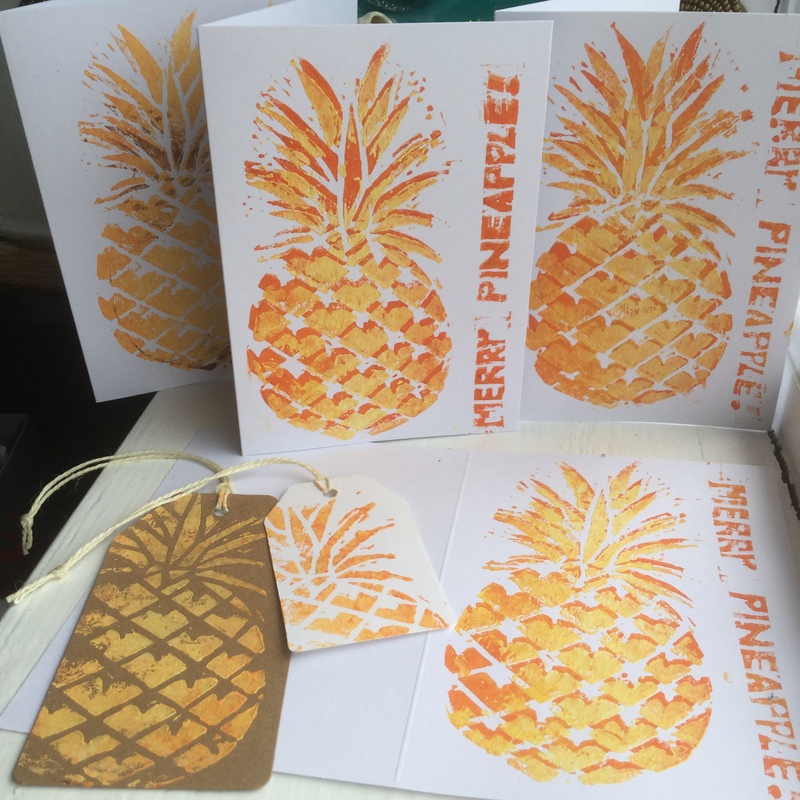 I had no idea what to do my design of but pineapples did seem to be a recurring idea. On the day Dawn taught us the basics and made sure we knew how to use the blades keeping safety in mind and always to keep our fingers out of the dirction we are cutting with the different blades. Luckily the lino we used was really pliable and easy to cut. It also has the advantage that you can use both sides. First we practiced with the blades. Then we all made a fish design to work through the process all together. We had a basic fish to trace and then we added our own design inside it. Next we all decided what to do as our main piece of the workshop. There were some books and magazines to give us some ideas if we didnt already have one. I was undecided, but in the end the pineapple fashion at the moment got the better of me! It didn’t look too complicated so I went for it! The paints we used were fabric paints. I tried using two layers of paint slightly not in line to try to get a more 3D effect. All the participants did totally different designs. Dawn, the teacher, had provided each of us with paper, some card blanks and gift tags to print on. So, was my experience as bad as when I did linocut printing in school? No! The lino is much much easier to cut, the blades were all sharp and the Dawn, workshop teacher, gave me ideas and help whenever I needed it. I really did enjoy doing linocut printing this time! Nothing at all like the school experience I had. I feel like doing more! Oh! My pineapple is just the beginning! If you don’t have lino to cut then potatoes are possible, cut up wine bottle corks or erasers. Have a fun creative fun week!